Outdoor patio furniture doesn’t have to be expensive, but making an up-front investment extends your usable living space to the great outdoors while ensuring comfort and longevity. A quality, well-protected patio furniture set allows you to host year-round celebrations, from barbecues in the summer to snowy gatherings around the fire in the winter. Once you’ve invested in the perfect patio set—whether it be patio tables, chairs and other lounge pieces— you must be mindful of how to protect outdoor furniture with quality patio furniture covers and a proper storage plan. When looking to preserve the quality and appearance of your outdoor set, as well as ensure longevity and maximum use, protection is key. This includes everything from cleaning and maintenance, to seasonal outdoor furniture covers, to storage during inclement weather. Consider these tips for how to protect outdoor furniture to keep your furnishings in prime condition for the foreseeable future. Regional weather conditions clearly have an impact on outdoor entertaining throughout the year, not to mention usage and protection of your patio furniture. Still, it’s important to consider how the elements could affect your furnishings at all time, even at the peak of entertaining season. Though many patio furniture materials come with protective chemical coatings to protect against sun and precipitation, be sure to read included care instructions for short and long-term use as the protection wears off. During the height of summer hosting, it’s normal to leave furniture uncovered for long periods of time. The searing summer sun causes textiles to fade, paint to yellow or blister and even materials to warp. 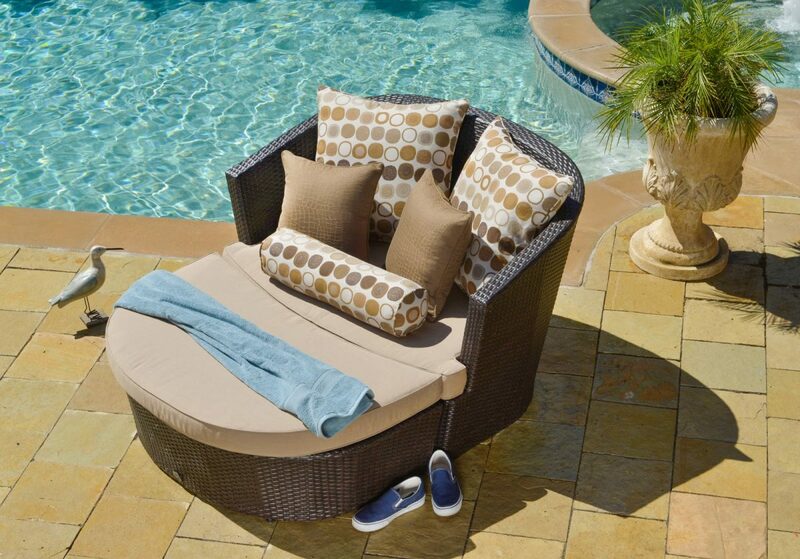 Use patio furniture covers to protect against long periods of direct sun. Wicker furniture is particularly prone to sun damage due to the painted exterior—always cover these pieces when spending more than two weeks outside without shade. 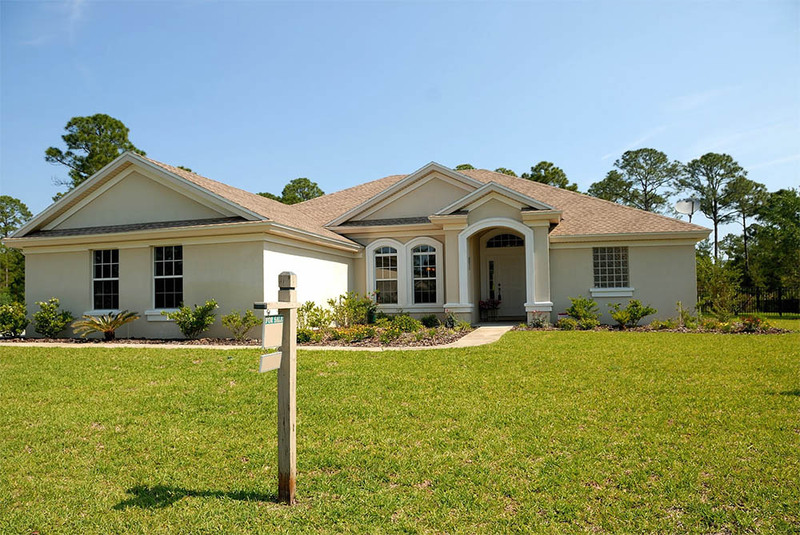 Spring and fall tend to bring rain and wind, and the latter often includes additional threats like falling leaves that can lead to rust, stains or mildew. This is when patio furniture covers really come in handy. Since you might want to use outdoor furniture when the weather is nice, leaving it outside is preferable. Outdoor furniture covers both protect your furniture and remain easy to remove when you want to entertain. As for the winter season, hosting and lounging depend on your region’s climate and level of patio coverage. Patio furniture covers may suffice for SoCal residents, for example, but may not be worth the risk if you live in a winter wonderland. If you’re confident that hosting season has passed, complete removal from the elements into storage is really your best bet. Space in your garage or a storage shed is ideal. Consider the tips below for storage preparation. Purchasing Furniture for your Space: It’s important to consider your available space—for both arranging and storing—when buying the set itself. 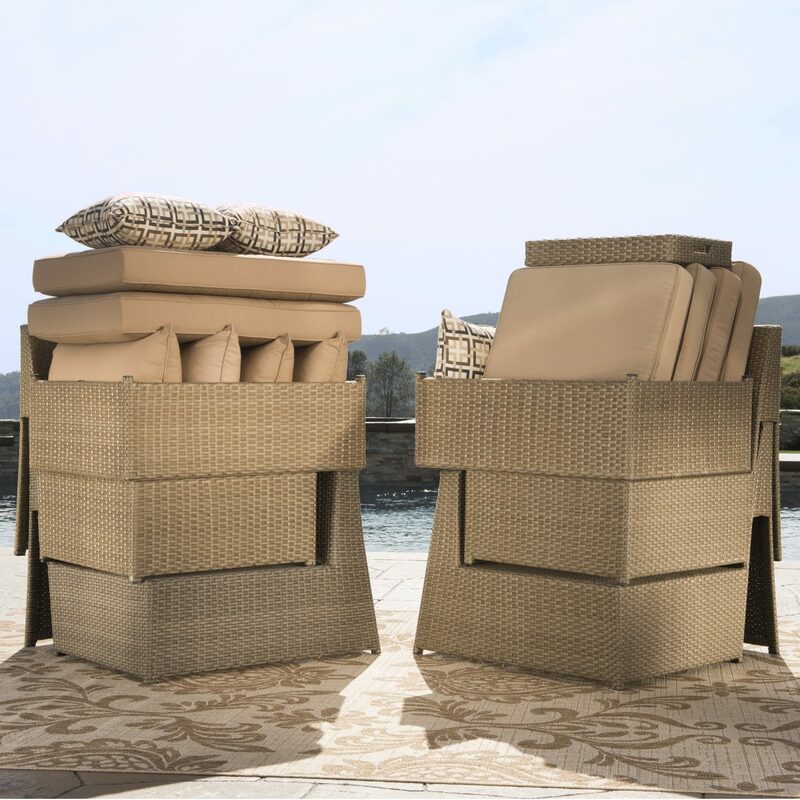 For example, stackable patio sets are ideal when storage space is limited. Choose Your covers: Options include tarps, generic protectors and custom covers, for example. 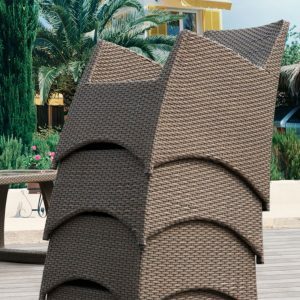 Purchase the correct variety of patio furniture covers for your unique set before any seasonal changes set in. Prepare for Transition: Measure furniture during the purchasing process to make sure it will fit into your intended storage space, through doorways and down and stairways or walkways. Short-term Storage Plan: Create a game plan for covering and storing outdoor sofas, chaise lounges, or patio tables and chairs to thoroughly prepare for any unpredicted shifts in weather. The first frost of the season is a good time to start prepping your outdoor patio furniture for winter storage. Follow these steps to ensure your furniture is ready for the switchover to the long-term stay in the garage or basement. If anything is broken, missing or in disrepair, now is the time to address the problem so each piece remains in good shape for next season. 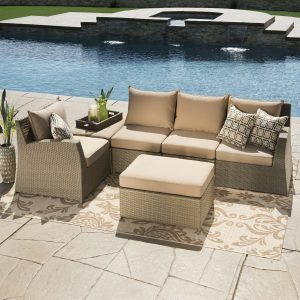 Clean outdoor furniture thoroughly to remove any built-up grime and flush out pests nesting in and around your furniture. Cleaning furniture properly varies by furniture material. Some cushions or cushion covers can simply be thrown in the wash, but since they are rated for outdoor use, hosing them down could work just as well. Gentle cleaning solutions of dishwashing liquid and warm water work well for spills and spot cleaning. Just make sure cushions are completely dry before they enter storage to avoid mold and mildew. Tip: If you have space bags, use these for airtight storage of patio cushions during their off-season months. Wipe glass tabletops with standard glass cleaner. Rinse metal and plastic furniture with a hose or clean with soapy water and a soft cloth as needed. Wicker and wood furniture can soak up water and suffer mildew, so cleaning with a bleach and water solution is best. This is also a good time to add a fresh coat of paint or finish if needed. If you’re dealing with high-end, temperamental materials like cedar and teak, peruse any instructions that came with your patio furniture purchase, as a special type of oil may be required. A long winter can leave exposed furniture in storage covered in dust and grime by the time spring rolls around, so it’s wise to utilize patio furniture set covers even for pieces stored in your garage or shed. A cover may go over the top of furniture or wrap around and seal it completely. As an easy solution, consider the Sirio Multi-Purpose Cover for Outdoor Furniture by Starsong, available in four sizes for a range of pieces. Consider the small or medium Sirio cover for single chairs, tables and small love seats, and the large and extra-large for patio couches, dining tables and considerable storage units. Each comes with easy-to-velcro straps, water-proof and cold-proof outer fabric, and padded handles. What’s best, these versatile covers stylishly blend with any patio or porch design when taken on an off throughout the season. Proper patio furniture covers protect from temperature and humidity changes in your storage space throughout the off-season. For additional outdoor furniture protection, you should also take steps to position your stored furnishings with care. One good option is to stack them on a wooden palette away from puddles or flooding. This will keep also furnishings off the ground and away from moisture that can seep through a porous concrete slab, or from potential pests. Whatever you choose, be sure the material is waterproof, mold and mildew resistant, heavy duty, and made to hold up to the elements. Don’t forget to cover items like your outdoor grill and fire pit, as well, whether they are in storage or they remain outside. Your outdoor patio furniture is an investment, and when you protect and store it properly, it will last for many years, providing the use value you expect. When furniture does eventually succumb to wear and damages that are beyond repair and it’s time to update, make sure to take the same care protecting and storing new furnishings to ensure similar longevity.